Have there been any spacecraft with internal SRM other than CONTOUR? I read about the CONTOUR mission which used an internal solid rocket motor to change the trajectory. Have there been other spacecraft using a solid rocket motor which is not jettisoned after usage? It was launched piggy-back on the Muses A (Hiten) probe into a highly elliptical Earth orbit which passed by the Moon ten times during the mission. At 19:37 UT on 18 March 1990 as Hiten approached its first lunar flyby, the small Hagoromo spacecraft was released into lunar orbit, making Japan the third nation to orbit the Moon. Although the S-band transmitter aboard Hagoromo had failed on 21 February 1990, the ignition of the Hagoromo deceleration rocket was confirmed by ground observation at 20:04:03 UT, the estimated orbit was 7400 × 20000 km with a period of 2.01 days. No contact could be established after orbit insertion. 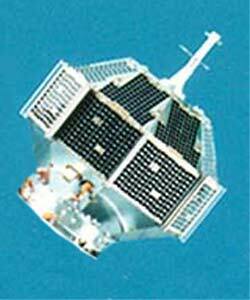 A solid propellant (KM-L) retrorocket with a mass of 4 kg was mounted inside the spacecraft for orbit insertion. @DavidHammen's answer to the question "How could tiny Hagoromo have been seen visually from earth confirming its lunar orbit?" is a click away and worth the read, so I won't re-quote it here. See both (either) linked question for more images of this kawaii spacecraft and it's "parent" craft. The Soyuz descent module has SRMs that are fired just before touchdown. Does that count? Not the answer you're looking for? Browse other questions tagged spacecraft mission-design solid-fuel or ask your own question. Was Hagoromo's capture into lunar orbit ballistic capture or more propulsive? Have the micronewton thrusters developed for the LISA mission been flight tested yet? Has any spacecraft landed on Earth with propulsion only? Or else, from what highest altitude? Why does NASA's Juno spacecraft only have a one year primary mission? Can solid rockets be used for flexible burn time by jettisoning them? Have any deep-space spacecraft supported same-band turnaround of Earth-based doppler measurements? Has lithocapture ever been seriously considered as a method of entering orbit around a planet or moon that lacks any atmosphere?